Este aviso fue puesto el 16 de junio de 2016. Steven Jay "Steve" Blum (n. Santa Mónica, California, 29 de abril de 1960) es un actor de doblaje estadounidense. Es conocido por ser la voz oficial de Wolverine en las últimas animaciones y videojuegos de Marvel en la actualidad. 2003 The Powerpuff Girls Arquitecto Ep. "Monstra-city/Shut the Pup Up"
2005 Loonatics Unleashed Fuz-Zs Ep. "Attack of the Fuzz Balls"
2014 Wander Over Yonder General Outrage Ep. "The Big Job"
↑ «Talkin Toons with Rob Paulsen: Episode 53 with Guest Steven Blum». Rob Paulsen's Talkin Toons podcast on Techjives.com. 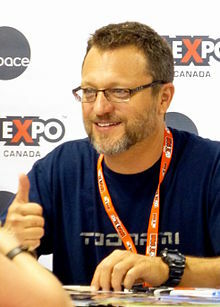 ↑ «Crystal Acids Steve Blum Page». Consultado el 18 de septiembre de 2012. ↑ «Identity Theft». Harvey Birdman, Attorney at Law. ↑ Steve Fritz (12 de febrero de 2009). «"Wolverine for Life" - Steve Blum, King of Voice Actors». newsarama.com. Consultado el 16 de noviembre de 2015. ↑ «Another Order of Evil: Part Two!». The Super Hero Squad Show. Episodio 2. Temporada 2. Cartoon Network. October 23, 2010. ↑ «Requiem for a Scarlet Speedster». Batman: The Brave and the Bold. Episodio 15. Temporada 2. Cartoon Network. October 1, 2010. ↑ «The Ballad of Beta Ray Bill». The Avengers: Earth's Mightiest. Episodio 8. Temporada 2. Disney XD. May 20, 2012. ↑ «Winter Soldier». The Avengers: Earth's Mightiest. Episodio 21. Temporada 2. Disney XD. September 30, 2012. ↑ «Project Predacon». Transformers: Prime. Episodio 15. Temporada 3. Hub Network. May 17, 2013. ↑ «Reunion». The Legend of Korra. Episodio 7. Temporada 4. Nickelodeon. November 14, 2014. ↑ «The Savage Spider-Man». Ultimate Spider-Man. Episodio 59. Temporada 3. Disney XD. October 7, 2014. ↑ «Beetle Mania». Ultimate Spider-Man. Episodio 16. Temporada 1. Disney XD. July 29, 2012. ↑ CartoonHangover2 (16 de octubre de 2013). «Voice Acting in Rocket Dog on Cartoon Hangover». YouTube. «Cartoon Hangover goes behind the scenes of Rocket Dog to see how the voice recording of the cartoon went from script to screen. Featuring an all-star cast that includes; Kari Wahlgren, Josh Lawson, Steve Blum & the creator herself, Mel Roach». ↑ «Spark of Rebellion». Star Wars Rebels. Disney Channel. October 3, 2014. ↑ «Steve Blum on how he developed Zeb Orrelios voice for Star Wars Rebels - Video Clip». HitFix. 25 de julio de 2014. Archivado desde el original el 18 de enero de 2016. Consultado el 19 de octubre de 2015. ↑ Goldman, Eric (18 de febrero de 2014). «Star Wars Rebels Exclusive First Look: Meet Zeb». IGN. Consultado el 14 de junio de 2014. ↑ «Race with the Demon!». Teenage Mutant Ninja Turtles. Episodio 6. Temporada 3. Nickelodeon. November 21, 2014. ↑ Max Nicholson (22 de noviembre de 2014). «Teenage Mutant Ninja Turtles: "Race with the Demon" Review». IGN. Consultado el 16 de noviembre de 2015. ↑ «White House Wabbit/Bugsbarian». Wabbit. Episodio 7. Temporada 1. Cartoon Network. September 25, 2015. ↑ «Wabbit's Best Friend/Annoying Ex-Boydfriend». Wabbit. Episodio 10. Temporada 1. Cartoon Network. September 30, 2015. ↑ «A Quest for the Lost Mixamajig». Mixels. Episodio 2. Temporada 2. Cartoon Network. September 26, 2015. ↑ «Pigfoot/Tae Kwan Bro». Pickle and Peanut. Episodio 8. Temporada 1. Disney XD. November 9, 2015. ↑ «Steve Blum on Twitter». twitter.com. Consultado el 9 de junio de 2016. ↑ B. Simmons (21 de febrero de 2016). «Transformers: Robots in Disguise "Overloaded, Part 1"». IGN. Consultado el 2 de marzo de 2016. ↑ «Overloaded, Part 1». Transformers: Robots in Disguise. Episodio 1. Temporada 2. Cartoon Network. February 20, 2016. ↑ Liu, Ed (25 de septiembre de 2014). «Toonzone Interviews Dee Bradley Baker & Steve Blum on How to Speak Boxtroll». Toonzone. ↑ All Movie Guide. «Hotel Transylvania 2 (2015) – Acting credits». New York Times. Consultado el 27 de enero de 2016. ↑ Beanstalk. 1994. 19 minutes in, and Closing credits. ↑ «Bang Zoom! Entertainment to Preview Adventures in Voice Acting Documentary at New York Anime Festival» (PDF). Adventures in Voice Acting. 4 de diciembre de 2007. ↑ «D.C. Douglas, Steven Blum, and ‘Apocalypse Kiss’ – Oh, my!». 15 de abril de 2013. Consultado el 15 de marzo de 2015. ↑ «Apocalypse Kiss Review». 25 de marzo de 2014. Consultado el 15 de marzo de 2015. Esta página se editó por última vez el 23 ago 2018 a las 16:51.